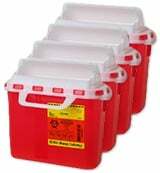 You are buying the BD Guardian Sharps Collector 5.4 Quarts Red Each 305517 Case of 4, model 305517, manufactured by BD. BD is a leading manufacturer of needles, syringes, and medical products designed for both professional and personal use. At ADW Diabetes, we offer the complete product line by BD with great savings and excellent service. 5.4 qt BD next generation patient / exam room sharps collector, 10.75 in. x 10.75 in. x 4 in. Red with horizontal entry. Counter balanced doors. BD Patient Room Collectors are available in BD Recyleen and BD Standard Brands and come in a variety of sizes and colors. All BD Patient Room Collectors have visible fill level indicators and handles for safe transportation. Dimension: 10.75 in. x 10.75 in. x 4 in.